The court, however, allowed the West Bengal unit of the BJP to continue with its proposed public rallies and meetings under its “Ganatantra Bachao Yatra”. The SC asked the Bengal Government to consider BJP’s revised proposal, keeping in mind the fundamental right of freedom of speech and expression guaranteed under the Constitution. “Once such a proposal is submitted, the State Government will consider the matter and pass appropriate orders, keeping in mind that the present involves a case of exercise of the fundamental rights, inter alia, under Article 19(1)(a) of the Constitution of India. It is in that spirit that we expect the State Government to deal with the matter on receipt of such revised proposal as may be submitted,” the SC said. The Bengal BJP had challenged the December 21 order of a Division Bench of the Calcutta High Court, which had set aside the order of a single-judge Bench allowing the processions. It had also asked the Bengal BJP to submit a revised plan for its “Save Democracy Rally” for the State Government’s consideration. “Looking into the details of the proposed rath yatras and the order of the State Government dated January 14, 2019, we cannot say that the apprehensions expressed by the State Government are totally unfounded,” said a Bench headed by Chief Justice Ranjan Gogoi. “It is for the State Government to maintain law and order in the State and the apprehensions expressed in the order will have to be addressed by the petitioner in a reasonable manner,” said the SC. The Bench, also comprising Justices L Nageswara Rao and Sanjay Kishan Kaul, noted the State Government’s submission that it had no objections in allowing public meetings and rallies and had merely sought the details and schedules of such events from the BJP. The top court also asked the State Government to respond to the revised proposal of the BJP with “utmost expedition”, keeping in mind that with the commencement of the CBSE and other board examinations, the use of loudspeakers might be banned. Appearing for the BJP, senior advocate Mukul Rohatgi said the State authorities were not granting permission saying the processions would be communal at some places and political at other places. He assailed the observations made in the report of the State chief secretary and other officials that the “rath yatras” would have members of the Rashtriya Swayamsevak Sangh (RSS), the Bajrang Dal, the Durga Vahini and the Vishwa Hindu Parishad (VHP) and said to note that the participants would make the rallies communal was improper. “All these outfits — RSS, Bajrang Dal, Durga Vahini and Vishwa Hindu Parishad — are not banned outfits. We are a responsible party. How can they say it will be communal at places and political at some other places? I have my fundamental right to say whatever I want,” Rohatgi said. Appearing for the West Bengal Government, Senior advocate Abhishek Manu Singhvi said they had no objections to public rallies and meetings, but the BJP was not giving the details of who will attend these events, how many people will take part and who will be the speakers. He added that the State Government had objections with respect to “rath yatras” as those would pass through various localities inhabited by different communities, including a sizeable population of the minority community. “The rath yatras will start from four different parts of the State, covering all the 42 Parliamentary constituencies, and over 2,000 people are expected to join each procession. The rallies will move to various parts of the State for 20 days. There are certain apprehensions with regard to the rath yatras, keeping in mind certain incidents of violence in the past,” Singhvi said. He added that the State Government had given more than 4,000 permissions to the Opposition parties over the last one year for holding meetings and rallies. 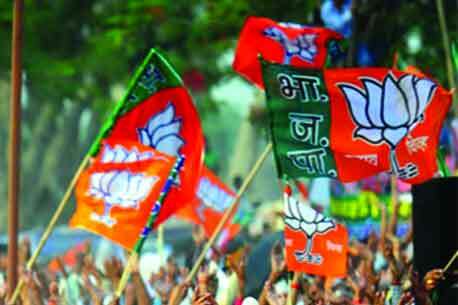 “The BJP was given permissions over 1,500 times to hold rallies and meetings in the last one year. It is not the case that we are not allowing the Opposition parties to hold rallies and meetings,” Singhvi said.